Author: Renata Ana Springer Bunk. Series edited by: Harry Stroomer. 14 pp. Roman, 106 pp. The Libyco-Berber inscriptions of the Canary Islands provide important historical evidence of the ancient inhabitants of the era before the conquest. They allude to their origin in Africa and thus verify the identity of the contemporary population, often being used as symbols. For research, these characteristics played a decisive role in many cases and language and script turned out to be considerable means of evidence, supporting increasing demands for the recognition of a “Berber identity”. Annalists of the conquest and historians collected numerous words and several phrases of the language of the ancient inhabitants of each of the Canary Islands, which were – along with place names – preserved to this day. Thereby they provided irrefutable linguistic facts attesting that the ancient Canarians were Berber speaking groups. However, it was not until the 19th century that the first Libyco-Berber inscriptions were discovered in the archipelago. The discoveries continue to date and are far from being completed as numerous recent finds demonstrate. Geographically, the Canarian archipelago constitutes the westernmost edge of the area of the Berber language and script. Yet, it features an extraordinarily high number of Libyco-Berber inscriptions in relation to the comparatively small land surface of the islands. For archaeologists, however, it is not only the abundance of discoveries that is decisive, but moreover the fact that they provide a basis for the interpretation of the origin of the ancient population and thus point to the approximate date of the beginning of settlement on the islands which coincides with the period of usage of this script in the northern part of the African continent. This book depicts the current state of research after several decades of continuous studies as well as the latest surveys and results presented in a manner intelligible not only to specialists. 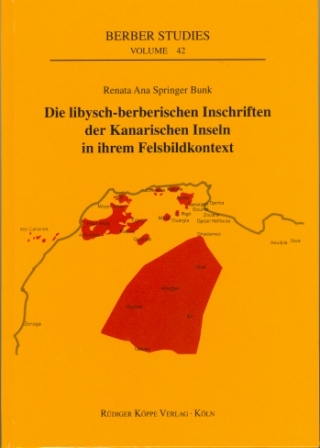 Renata Ana Springer Bunk – being a philologist as well as an archeaologist – is engaged in research of Libyco-Berber inscripts since more than 30 years. The script data she analyses in this book were gained through field surveys and documentation on the Canary Islands as well as in several regions of Morocco, Algeria, Tunisia, Libya and Mali. The author is not only a specialist in the field of Libyco-Berber inscripts, but is also familiar with the history and culture of the areas under investigation and – all the more important – with the complex diversity of the North African and Canarian rock carvings, which renders her work even more valuable. L’ouvrage de RSB marque une importante étape de la recherche sur la situation des Canaries préhispaniques. Il offre la synthèse la plus sûre et la plus commode de la documentation actuelle. De plus, (et ce n’est pas le moindre effet du livre, car les Canaries demeurent quand même éloignées de l’Europe), je vois dans ce livre un rappel très clair de la présence de nos collègues insulaires dans le monde de la recherche européenne et mondiale.